Limit the ride time to 60-75 minutes during the week and 90 minutes on the weekend. Add structure to the workout. Work on Advanced Aerobic Endurance. Never “just ride” in zone 2. In January we like to add advanced aerobic endurance intervals to our athletes’ trainer workouts primarily in the form of Tempo and Sweet Spot workouts. By riding at higher intensities than traditional wintertime “base miles”, the athlete will achieve more physiological adaptations and make better use of his or her time. The 2:1 work-to-rest ratio (for example, 10 minutes on, 5 minutes off) is more productive when training indoors. Tempo and Sweet Spot intervals are as hard as we have athletes go on the trainer in the winter. To continue the progression and to help the time pass quicker, we add bursts to the tempo and sweet spot intervals. For example, during workout #1 above we’d add a 5-second burst greater than 450 watts every 2 minutes during the 8 minute tempo interval. Not only is this specific to races that many of our athletes compete in, by having a burst to do every 2 minutes it actually helps the time pass by quicker! Overall the number of intervals and their length can be widely varied. Most athletes should start with a total of 20-30 minutes of tempo work during the workout, and increase the total load as they go along the season. Lastly, even though you are indoors don’t forgot to use a fan and drink plenty. 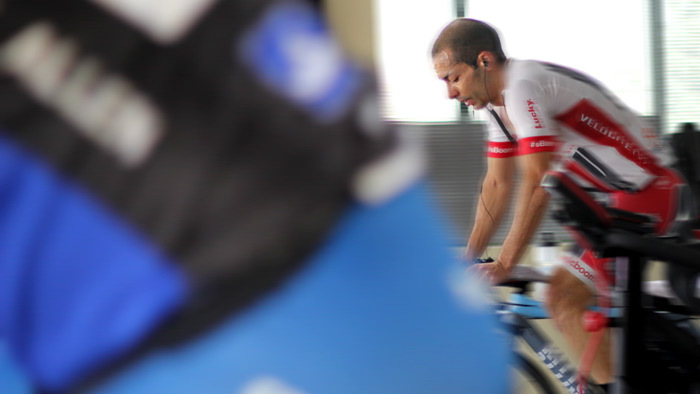 Looking for more indoor cycling workouts? Check out FasCat’s cycling training plans on TrainingPeaks. Frank Overton is the head coach and founder of FasCat performance cycling center and coaching group. Frank has been a cycling coach since 2002, a USAC Level 1 coach since 2006, and has a degree in Physiology for North Carolina State University. In addition to racing competitively as a mountain biker and then as a Category 1 road cyclist for over 10 years, he has worked for the US National Team in Europe as well as Priority Health Professional Cycling Team. 'In 2010 Frank opened up the FasCat Performance Center in Boulder, CO for their retail power meter sales, indoor cycling, bike fits, exercise physiology and coaching offices.